Do you love pizza? Do you love peanut butter? Do you love camp? Do you love music? Do you love your parents? But can you actually put pizza, music, parents, and peanut butter in the same category? Our society has only a vague idea of the notion of love. We apply it to everything from our new iPod® to our grandparents. In the case of Scripture, though, God has an incredibly specific portrait of love: God sent His Son into the world to die on our behalf. Read 1 John 4:7-12, then read verse 7 again. According to these verses, from where does the idea of love come? If true love comes from God, what are its elements? What do these verses teach you about how much God loves you? Does God only love lovable people? Why or why not? How might this have an effect on how you treat those around you? What opportunities will you take this week to show real love to those who are not particularly lovable? Last week, I asked how you could identify a Christian. It’s not by our compelling preaching, our worship, or our programs. While all of these things can be useful tools, the real indicator of what we really believe is how we treat one another. That means that you are respectful, caring, self-sacrificing, and humble—and not just at church or when you think someone is watching. What do your actions tell others about God? Hopefully your actions and the way you treat others shows the world a little about the God you believe in, the God who is love. 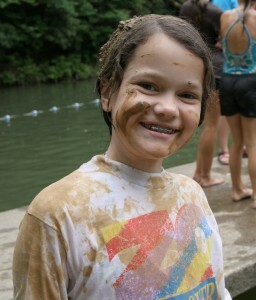 Posted in Devotions, Girls | Tagged 1 John 4, Camp Crestridge, Reprinted from ec magazine. © 2011 LifeWay Christian Resources of the Southern Baptist Convention. Used by permission.